How Digestate Evaporators for Anaerobic Digestion Plants add product value and aid organic waste disposal. 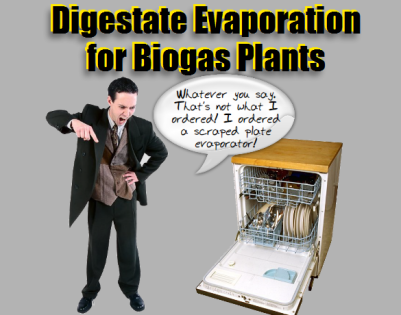 In this article we consider the recent developments in liquid digestate evaporation technology, where evaporators can either be used to improve the marketability of the liquid digestate output from biogas plants by heat pasteurisation, or by reducing volume the digestate to reduce disposal costs. So, the sale of digestate in its much lighter and more concentrated crystaline form, after evaporation, may make commercial sense if the digestate is created in a region abundant in AD Plants such as a dairy farming region, but sold for use on arable land. The ability to reduce the volume of digestate for disposal can also be very useful where the AD process produces digestate which is unsuitable for agricultural use in its raw form, such as the digestate from Municipal Solid Waste digesters. 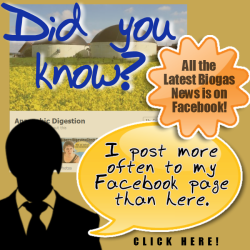 Finally, before we provide details of some of the most interesting recent articles on this subject, and before anyone leaves due to worries about the admittedly very substantial energy use of liquid digestate evaporation technology, let the reader not forget that many AD Plants are in isolated locations and therefore lack a buyer for their CHP power. The Barkip Anaerobic Digestion plant will be the first of its kind to incorporate a novel digestate processing stage: Waste heat from the CHP engines is used to concentrate the liquid fraction of the digestate into a nutrient rich liquid fertilizer. Under the terms of the contract, the HRS technology will enable the Barkip Anaerobic Digestion plant to process 75,000 tonne’s of waste annually, in a plant setup that produces around 2.5MW of renewable electricity which will contribute towards Scotland’s renewable energy industry. So, it seems that much can be done to improve the value of digestate, and even potentially on some occasions, alleviate the problems for digestate sales which are inherent when digestates fall to the demands of the Animal By-products Regulations. Your comments are welcome on this rapidly developing Anaerobic Digestion (AD) subject area, so please give us your thoughts on the use of Digestate Evaporators for Anaerobic Digestion Plants Add Product Value and Aid Disposal.